Judith Thompson’s latest play takes as its subject the news from 2007 when Ashley Smith, an 18-year-old inmate from New Brunswick, strangled herself in her cell with strips of cloth tied together while guards videotaped her death. The guards did not enter her cell until 45 minutes after Ashley began to strangle herself because the warden had given them strict instructions not to enter her cell until she had stopped breathing. A further disturbing fact was that Ashley had originally been sentenced to one month in a juvenile detention centre for throwing an apple at a mailman, but that sentence was gradually lengthened due to accumulated demerit points to five years. Thompson’s outrage at this story is palpable in Watching Glory Die, which had its world premiere in Vancouver last month. Ashley has become the character Glory of the title and the play was written with the consent of Ashley’s mother, who here is called Rosellen. The third woman in the play is Gail the corrections officer who was one of those who watched Glory’s death. To understand how this terrible event occurred, Thompson looks at how the fates of these three characters are intertwined. Thompson herself returns to the stage after a 35-year absence to play the three women. What is so odd about Thompson’s play is that she has not managed to translate her outrage into dramatic tension. Structured as a series of intercut monologues, the three characters never can never directly interact with each other and their conflict can never directly be portrayed. 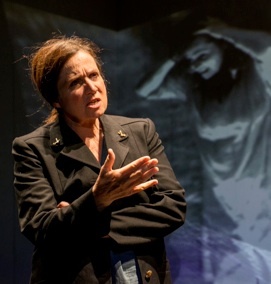 When Thompson has to be both Glory and Gail in the climactic scene of the play, Thompson plays Glory strangling herself on stage while we hear Thompson’s recorded voice as Gail questioning what she should do and when she should enter the cell, the effect thus undercutting the drama. Except for that one scene, conflict is absent because the situation is simply one where we watch a bad situation progressively get worse. Thompson’s main point is that all three women are helpless and the only way Glory can change her situation is by committing suicide. A further difficulty is that the only character we can identify with is the guard Gail. Straight-talking and unpretentious, she is critical of the institution but at the same time doesn’t want to lose her job. She is happy to show visiting journalists the features of the highly praised Grand Valley Institution for Women (the real name of the place where Ashley Smith died) that they are meant to see, but is disappointed when no one takes her up on her offer to show them the parts of the facility they are not meant to see, like the “segregation” section or the “therapeutic quiet” (i.e. isolation) cells where Glory is held. Our reaction to Rosellen is conflicted. She adopted Glory when Glory was only two months old and says she can’t understand how her daughter could be in prison given the perfect upbringing that she gave her. Yet, when Glory is first taken off to juvie, she notes that Glory committed more infractions after her arrest because she finally found a place where she fit in. In a manner atypical of her writing, Thompson does not explore this contradiction in Rosellen. Gail is aware that Glory is mentally ill and should be in a psychiatric ward not a prison, but Rosellen never even brings up the topic. It therefore never occurs to her that Glory could have inherited her mental illness from her birth mother and that all of Rosellen’s nurture could not alter Glory’s nature. We would like to feel sympathy for Rosellen but it is difficult when Thompson has given her lots of motherly emotion but so little insight. As for Glory, her mental state prevents us from identifying with her. Thompson places us in the same position as Gail in watching Glory deteriorate without being able to do anything about it. The Glory that we see is completely different from the Glory Rosellen imagines. The mother thinks she can feel everything her daughter does, but Thompson shows that is false. Rosellen says she feels as if she is inside Glory, when in fact Glory’s worsening nightmare is that her birth mother in the form of a crocodile is working her way inside her and wants to drag her down into the swamp with her. If there is a struggle in the play, it is Glory’s struggle against the pull of her “crocodile mother” who wants to destroy her. n’s set. Crocodile leather for the mother, breaking glass when Glory recalls being tasered and numerous abstract images reminiscent of 1960s psychedelia make Glory’s cell the most visually interesting space on the stage. This device is also counterproductive. While the projections are meant to let us inside Glory’s disturbed mind, it also means we do not experience the crushing boredom of the four white walls of Glory’s isolation cell that Glory and Rosellen keep speaking of, Rosellen likening the cell to an all-white veal pen. Contrary to what Gail and Rosellen seem to think and contrary to Thompson’s own critique of the prison system, the production suggests that Glory commits suicide not to escape the isolation of prison but to escape the horrors of her own mind. Thus, it seems that Thompson has begun the play with one intention but in the process of writing has come up with a play with quite a different meaning. Thompson means to show that all three women are trapped in different ways by the prison system. Glory is literally trapped, Gail is trapped by its rules and Rosellen is trapped by waiting in vain for Glory’s release. Gass underscores this cleverly through his staging. Thompson wears a blue prison shift throughout, but changes to clogs and a jacket as Gail and into a sweater as Rosellen. As the action progresses, Gass gradually has Thompson omit the jacket, clogs and sweater as markers to differentiate the characters. By the end they all look like Glory even as Thompson expertly distinguishes them with radically different voices. By the end both Gail and Rosellen find their way into Glory’s cell. Thompson would like us to see the evils of the prison system and how it affects both the guards and the families of inmates. The question she actually brings up, however, is the equally important issue of the incarceration of the mentally ill. How Glory’s mental state could go unnoticed and inadequately treated for so long has far-reaching ramifications concerning definitions of criminal behaviour. Unfortunately, Thompson doesn’t begin to explore these. Thompson takes the action past the inquest that followed Ashley’s death and led to the firing of the guards. At the inquest the guards could say nothing in their defence except that they were “just following orders”. Thompson does not let the overly familiar Nazi reference lie there but has Rosellen compare the prison to a concentration camp. To leap to Nazi references turns whatever Thompson wanted to say into clichés. Fans of Thompson will doubtless want to see her on stage acting in one of her own plays no matter what the play is like. They will be pleased to find that the renowned playwright is also an accomplished actor who so clearly distinguishes the three characters in voice, gesture and posture. At the same time it’s hard not to notice that the play hardly delves as deeply into the subject matter as it should. While it is great to see Thompson on stage, you can’t help but wish the play itself were more incisive. Photos: (from top) Judith Thompson as Glory; Judith Thompson as Gail. ©2014 Wendy D.